Tokyo, Japan – April 22, 2015 — Noble Master Games releases “Demise of Nations: Rome” as EARLY ACCESS after 2.5 years in development. The game is a WE-GO turn-based grand strategy during the rise and fall of the Roman Empire. It’s a mix between “Civilization” with and “Unity of Command” featuring deep game-play including research, city-building, trade and resource management. In Demise of Nations a player commands his armies in one of the many ancient countries including the Roman Empire, the Greeks, Carthage and Sparta. From Rome to Celtic nations, one creates his own warring experience. Wage colossal wars solo, against the AI, or take on your gaming friends in cross-platform multiplayer games. Form alliances and fight co-op style with the AI and other players for ultimate victory. The game supports cross-platform multiplayer matches against players on PC, Mac and Linux. 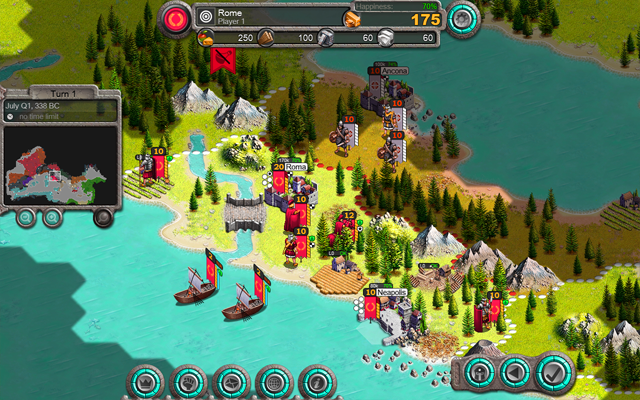 Turn-Based 4X Grand Strategy during the Rise & Fall of Rome. Cross-Platform Multiplayer/Hotseat-Play including co-op games. Nations include the Roman Empire, Carthage, Greeks, Sparta, Persia, Gaul, Celts, Germania amongst others. Troops including swordsmen, archers, horsemen, scouts, barbarians, mercenaries amongst others. Ships such as fishing boats, transport ships, galleys and longboats. Demise of Nations is available in the English language (other languages in the works). The game is free-to-play and can be downloaded directly from the official website or via Steam. For additional information on Demise of Nations such as press kit and promo codes contact Christoph Aschwanden.